Leo Burnett is confused about professionlism in advertising. This is the kind of thing an agency starts with good intentions and ends up doing something remarkably boneheaded. 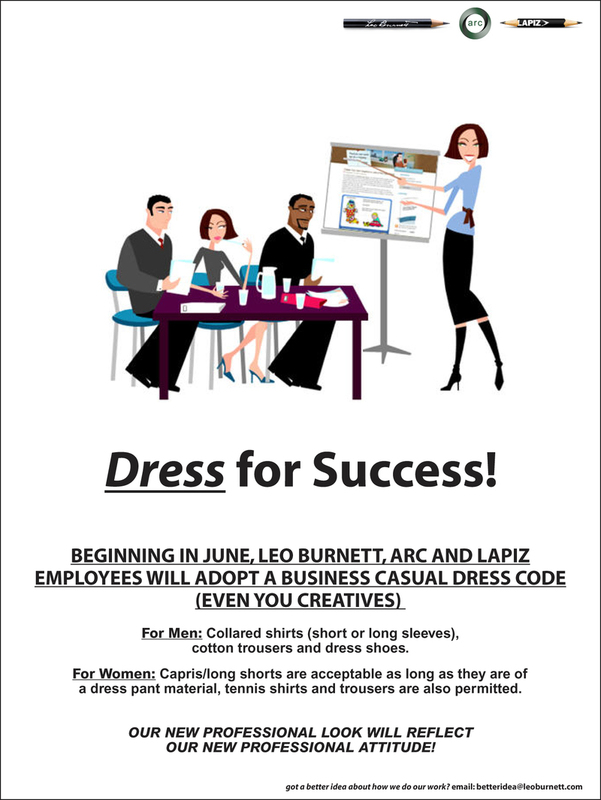 Of all the things an ad agency can do to improve it’s creative offerings, client relations, operational efficiency and over all culture – setting a dress code seems like the wrong choice. Ad agencies, amongst all people, should know about finding superficial solutions to deeper problems. UPDATE: Stumbled across this speech…a must watch for the people who created the above poster. UP-UPDATE: Turns out, this is a spoof by the agency itself. The thing is, what made bloggers go mad is that Leo Burnett, the ancient dinosaur that it is now, is perfectly capable of doing something like this. Okay, seriously, this is quite a good one folks.